Increased competition in the tablet segment apparently hasn't stopped Apple's iPad from continuing to dominate, as a new study finds that the iPad accounts for nearly seven out of eight tablets active on the Internet in North America. The new study comes from advertising and Web analytics firm Chitika, and it found that North American web usage among tablet devices in the month of June was overwhelmingly skewed in favor of Apple's tablet. The iPad held an 84.3 percent share according to Chitika's measure, up nearly two percent from May and up nearly three percent from its position in April. Apple's gain came at the expense of virtually all other players in the tablet segment. Amazon's Kindle Fire devices dropped from 7.4 percent in April to just 5.7 percent in June, while Samsung's Galaxy line of tablets fell from 4.7 percent to 4.2 percent over the same period. Only Barnes & Noble's now defunct Nook tablets and Microsoft's Surface tablets gained any actual share of web traffic in June. While it didn't invent the segment, Apple largely revolutionized the tablet market by bringing its touch-friendly iOS platform to a larger screen. The Cupertino company has continually tried to press its advantage in the segment, with CEO Tim Cook arguing that the tablet market is "the mother of all markets." Other manufacturers have flooded the market with competing devices, and industry analysis firm IDC predicts that Android tablets will overtake the iPad this year in terms of units shipped. More recently, an analysis from Strategy Analytics had tablets running Microsoft's Windows 8 platform taking 7 percent of shipments in the first quarter of this year. 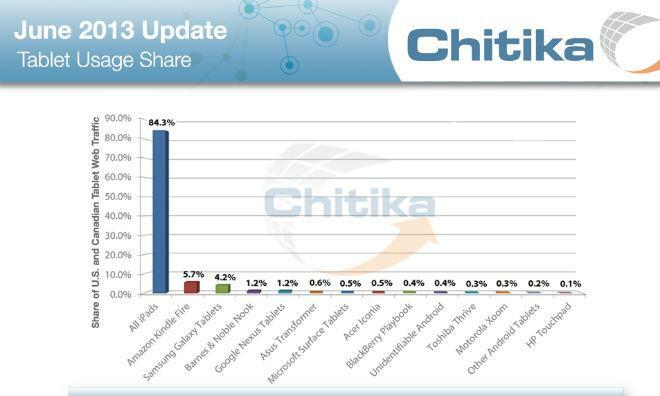 Chitika's figures, though, measure web use market share according to the Chitika Ad Network, which draws data from tens of millions of U.S. and Canadian online ad impressions.